It’s funny how much I let the weather determine my food cravings. Warm & sunny – tacos, cold & rainy (or snowy as the case lately has been) – curries or stews. This week just means I’ve been schizo on my wants: today, 65 degrees, Friday, going to be snowing with a high of 29. Seriously, what’s a dinner making girl to do? So I decided to cook up a new plan of action: instead of letting the weather plan my meals, let my pantry do the work. I’m a hoarder of different and interesting foods and my annual(ish) trips to Atlanta and the Dekalb Farmers Market only exacerbate that. Red, black, or red quinoa in quart containers for $6? You betcha. Kamut in a quart container for $4? (You know I bought at least one.) Lentils of every single variety? Yup. Let’s just say my pantry needs a little TLC. So this week, I attacked the ever-growing stack of lentil containers, starting with the ones I use the least–red lentils. See, I have no ill will towards red lentils, it’s just that I don’t really love how they mush up. I prefer beluga or French green lentils for their hardy, round bite, their meatiness. Red lentils just remind me of baby food. And wisdom teeth extraction. But going with the theme of ‘use what I have,’ I also decided to use a recipe I’d squirreled away on Pinterest–The Spice Spoon’s Pakistani Chana Dal. I didn’t have high hopes for the recipe since the ingredients (including spices) were pretty limited–chana dal, tomatoes, turmeric, onion, a pinch of red pepper spice–but the result was incredible. All of a sudden, after an hour or so of cooking, I had this huge pot of warm, silky, hearty lentil dal with hints of ginger and turmeric, a tiny bit of heat from the cayenne pepper I used. It was simple and rustic but elegant in its flavors. I may have become a red lentil convert thanks to this recipe. You can, of course, use chana dal as the recipe suggests, but red lentils work just as well. I preferred to soak them ahead of time to cut back on cooking liquid and time, but if you don’t soak the lentils, just add a cup or two extra of vegetable broth and cook the lentils for a bit longer. Soak the lentils in cold water for 1 hour. Rinse and drain. Warm the olive oil over medium-low heat in a stockpot/Dutch oven. Add the onions, bring to a sweat, and as the onions turn translucent, lower the heat to low and caramelize the onions (~30 minutes). Once the onions are caramelized, add the turmeric, salt, and cayenne pepper. Stir to coat the onions. Add the tomatoes, tomato paste, broth, and ginger. Raise heat and bring mixture to a boil. Add the lentils, stir to combine. Add lentils, reduce heat to low, cover pot with a lid, and simmer 45 minutes – 1 hour until the lentils are soft and the liquid has reduced. Remove and discard the ginger pieces and serve with flat bread/baguette/whatever you have on hand. i love red lentils, but do not utilize them enough. this dal looks delicious, and i agree, the ingredients list seems to be lacking something to make it look like a legitimately delicious recipe. but, i am a great lover of simple recipes. gotta try this out! Using a good quality veg broth helps a lot, I think. 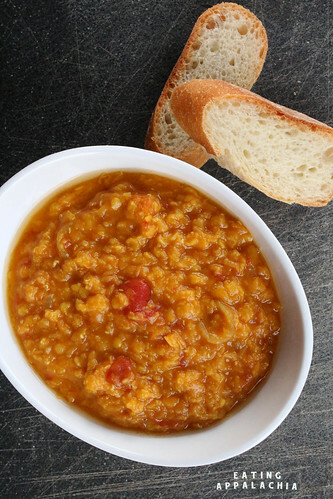 Hmm–I don’t think I’ve seen a red lentil dal with so much tomato content before! Very interesting indeed. This may have to happen, especially since we also have at least three different kinds of lentils, including red, helping to fill up the freezer. This looks so tasty! I love that the ingredients are simple. I am a terrible home cook, but may have to try this one. I love the simplicity of a great dal! Like you, I have a well stocked pantry but need to clear it out in 6 months before I move! Personally, red lentils are my favourite of the lentil gang… so versatile, they can handle pretty much any spice I can muster. The weather and the fridge are always telling me what to make too. I’m not a big fan of lentils but I’m slowly coming around and I’m starting to like them more and more. That big bowl of red lentils looks delicious! It looks a little bit like chili. Three cheers for pantry meals! I also have everything on hand to make this right now, which is quite exciting since I’ve wanted something hearty, warm, and soupy/stew-y all day. Done deal!